What If My Dog Ate A Wolf Worm? One of our readers recently asked us, “What if my dog ate a wolf worm? 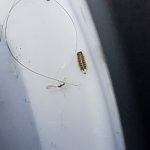 Will he get them under his skin or will they die in his stomach acid?” Wolf worms, also known as screw worms or bot fly larvae, are parasitic worms that can infect both domestic and wild animals. These parasitic worms aren’t intestinal parasites though, they actually infect the skin. So, if our reader’s dog ingested a wolf worm, would they simply dissolve in his stomach and be digested normally, or would they appear in his skin? Let’s explore how exactly a dog (or other animal) might become infected with wolf worms. The process begins when a female bot fly lays her eggs in or near a nest or den of animals, such as rodents. The larvae are able to sense heat so they know when the mammal is close by, and will then hatch and enter the host through its mouth, nose, or a wound on the host’s skin. The wolf worm will then work its way through the digestive system if it goes through the nose or mouth, and work its to the skin. Once in the skin, the wolf worm burrows out, creating a hole to breathe through until it is mature enough to exit the skin. These holes are often visible, so a pet owner will be able to see if their dog or cat is infected with wolf worms. So, if our reader’s dog ate a wolf worm, the larvae would have entered the dog’s body through his mouth. That means that the wolf worm could have found its way through the digestive system and to the dog’s skin, where it would have burrowed a hole. If the dog truly ate the worm, chewing it and killing it before swallowing it, then the remains of the wolf worm would just be dissolved in his stomach acid as our reader described. 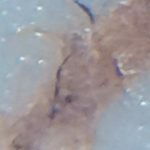 Therefore, depending on how the dog consumed the larva, there is some possibility that the wolf worm might infect his dog’s skin, but we don’t have enough information to confirm or deny this. If our reader notices a burrowing hole in his dog’s skin, or if he is worried about the health of his dog, we highly recommend he bring his dog in to see a vet. Removing wolf worms is a tricky task that we wouldn’t recommend he attempt on his own. 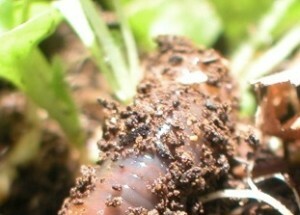 The innards of the larvae can cause severe infection and sometimes a deathly allergic reaction, so removing the wolf worms without squeezing and killing them is crucial. 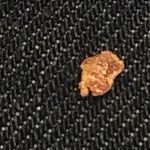 If our reader can’t take his dog to the vet immediately, in the mean time he can use a warm compress on his dog’s visible cysts, if there are any. To wrap up, one of our readers asked what might happen if his dog ate a wolf worm. There is some possibility that his dog’s skin might become infected with these wolf worms, but we don’t have enough information to declare if this will occur or not. We encourage our reader to take his dog to the vet since they will be better equipped to handle and advise on this matter! One of our readers asked what might happen if his dog ate a wolf worm. 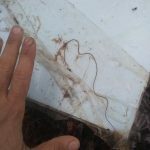 There is some possibility that his dog's skin might become infected with these wolf worms, but we don't have enough information to declare if this will occur or not. 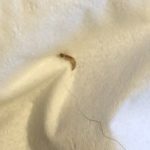 Is Worm Found Near Dog Flea Larva? 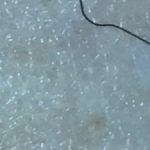 Is Worm on Foot Parasitic? 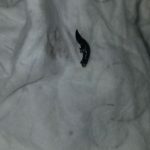 Are Worms Found on Mattress Related to Dog?